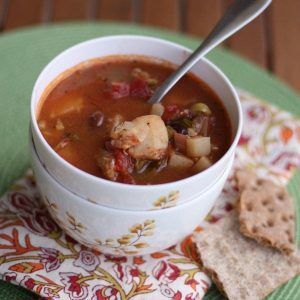 This is my first time participating in Kitchen Play’s Progressive Party and I’m happy to be be bringing some of this delicious Italian Fish and Potato Stew made with this month’s featured ingredient – potatoes. When I initially started thinking about creating a soup with potatoes, I immediately started thinking of creamy soups. I might be in the minority here, but I don’t get excited about creamy soups. Then I remembered that most chowders, specifically my favorite type of chowder – Manhattan style – usually have potatoes in them. Ding ding ding! 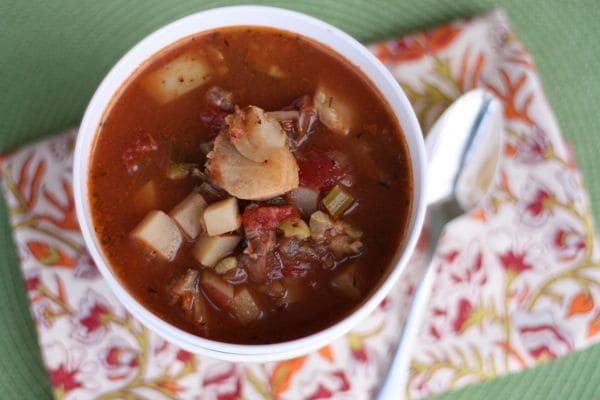 Since I had a nice piece of cod in the freezer already, I picked up some red and white potatoes along with a few other ingredients and put together this comforting, straight forward soup that was enjoyed on a dreary rainy afternoon. This Italian Fish and Potato Stew is actually inspired by a stewed cod fish dish my grandfather makes every Christmas Eve. It’s hearty, and perfectly satisfying. It’s chock full of good clean vegetables like potatoes, celery, onion, tomatoes and garlic. I brightened it up a bit with a little clam juice and fresh squeezed lemon. At the end I threw in some roughly chopped green and kalamata olives along with the chunks of fish. It is absolutely delicious, and incredibly good for your health and for your soul. I chose white and red potatoes for the soup because I knew they would hold up well in the hot liquid. I diced the potatoes just small enough so that they would cook up at close to the same rate as the other veggies in the soup. 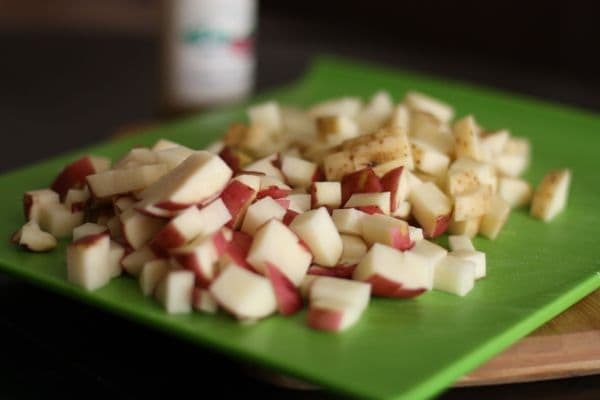 Adding potatoes to a healthy soup like this is a great way to add a little extra nutrition, since they are naturally fat free, high in vitamin C and great sources of fiber and potassium. Now that is my kind of soup. In a large soup pot, heat oil and add onion, garlic, celery and potato. Season with thyme, oregano, salt and pepper. Saute for about 10 minutes until slightly softened. Add tomatoes, clam juice, lemon juice and broth. Bring to a boil and then let simmer for about 20 minutes, until potatoes are soft. Add pieces of fish and olives to soup and gently stir. Continue to cook for another 15-20 minutes until fish is cooked through. Taste for salt and pepper and adjust accordingly. Serve with whole grain bread, crackers or on it own. Stay inspired to include potatoes into your diet by checking out the US Potato Board’s Facebook page or by signing up for the US Potato Board weekly recipe email here. The US Potato Board is also sponsoring a wonderful giveaway here at Kitchen PLAY. Simply recreate any one recipe from this month’s Progressive Party, post about the experience on your blog and provide a link to your post on Kitchen PLAY to enter. All qualifying bloggers in each course will be entered to win $100 (6 prizes total). The deadline is April 15, 2012. Please review the complete contest rules before entering. Good luck! This recipe looks so warm and inviting. I’m not a massive fan of fish, so I’m looking for ways to incorporate it into our diet that aren’t overly ‘fishy’. I’m keen to give this a try. It’s my kind, too! Me, too!! That is such a gorgeous bowl of soup! So comforting too! This is my first time to participate at Kitchen Play too, it was fun! Love, love, love this, Aggie! This sounds so hearty and delicious, Aggie! Wish I had a bowl for lunch! Oh my goodness, girl. I want to eat every night at your place! This sounds fantastic! I don’t get very excited about creamy soups either – this is much more my style! awesome job! I need to to show this to my husband, who apparently has no idea what Yoda looks like, as evidenced by our most recent Draw Something game. This sounds delicious…what a gorgeous stew! Wow, this looks good! i am bookmarking so I can make it soon. I just bookmarked this post. My husband’s going to love this recipe I’m sure. He’s got a thing with potatoes and fish… 😉 Excellent food photography. Beautiful photo! I never thought to make a ‘fish” stew before. Must try asap! My hubby would just love this stew, thanks. This soup looks wonderful! I can’t wait to try it! Thanks for posting!! number of servings estimate would be useful. Thanks for the great recipe! I used homemade fish broth and added oysters and artichokes. Delicious! I made this last night with a few changes that I will note here. It was really delicious and my husband and I agreed it was a keeper. I wanted to make a fish stew using catfish and serve it over rice. Aside from the below modifications I followed the recipe. No oregano, I was out. Your version sounds delicious!! Thank you for stopping by and sharing!